I've quietly been a fan of James Austin's work. 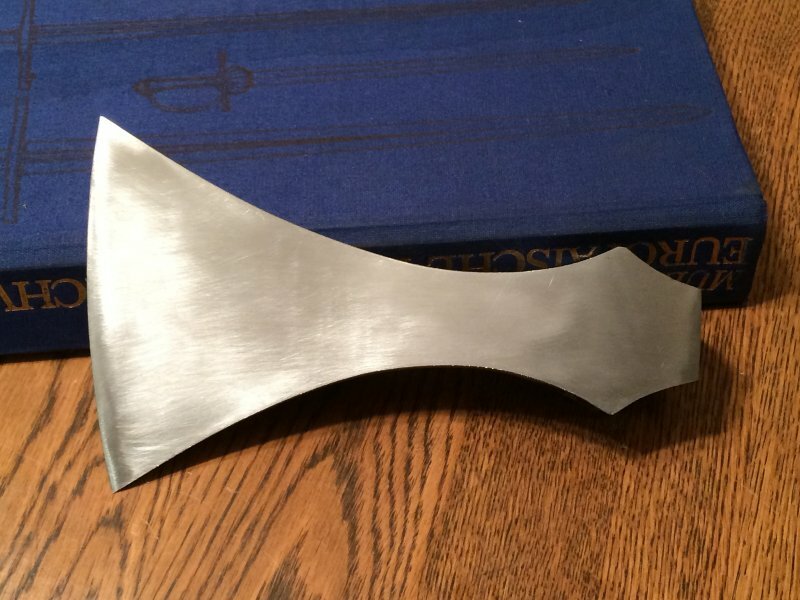 I've been reading his blog and watching videos on YouTube to glean any bit of knowledge and learn his techniques for making axes. This axe represents a step forward for me. I utilized many of his techniques and even made many of the tools he uses for the creation of his axes. Not sure exactly where this falls in the Petersen typology, so I'm calling it a G/H hybrid. Typologies are only a guide anyway. Sometimes certain shapes don't fit it exactly. I'll finish the polish tomorrow. I am intentionally leaving some forge pits and file marks on the piece to add character. Overall, I will give it a higher grit finish and then draw it back to a smooth satin. Some of the pits and file marks will show through the finish. I plan on hafting it this week with a hickory haft. The blade is 4.5" (11,4 cm). Overall length is 7.5" (19,5 cm). Socket and body are 1018 and the bit is 1080. If you are interested in receiving email updates about future projects, send me a PM or email me at ericmycue374@comcast.net and I will add you to the list. Nice piece! Looking forward to adding some of your work to my collection. Finished polishing and hafting the Type G/H. I want to name this axe Neckbiter. Not sure how you would say that in Old Norse. Anyway, that is the feeling of this light and agile axe when you swing it. I see a warrior with a shield in one hand and Neckbiter in the other finding a hole in an opponent's guard and then plunging it into his neck. I apologize for the poor pictures. I am in the process of acquiring better photo equipment. In many ways, this axe was a leap forward for me. I was able to use more authentic techniques and tools to create this axe. Being able to forge-weld eye socket, body, and bit together, and have it turn out virtually invisible, has been a goal of mine for years. 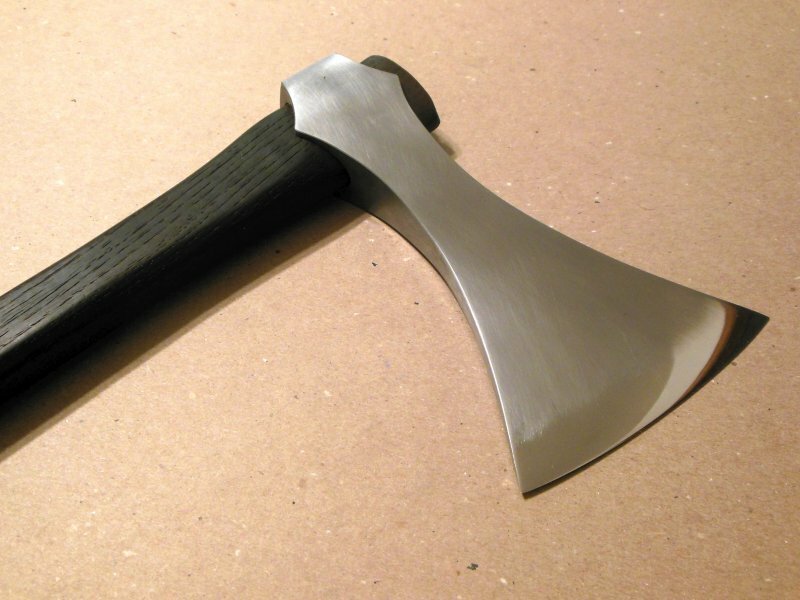 This opens the door to many new options for making Viking axes. I have quite a few projects planned for the near future using these new methods. Back to Neckbiter: The blade is 4.5" (11,4 cm) wide. Overall length is 7.5" (19,5 cm). Socket and body are 1018 low carbon steel and the bit is 1080 high carbon steel. I used my Rockwell files to test the edge post-heat treat and it comes out between 50 and 55 Rockwell. I purposely left some of the files marks in the finish. These files marks are often seen on period originals; and I have to admit, I was not brave enough in years past to leave them on a piece. Now a days, I decided I'm going to make something that pleases and inspires me. Hopefully, others will find it inspiring too. Interestingly enough, it is actually harder to do this finished than just putting a high grit belt on the grinder and removing all the marks. I also left some of the forge pits in the piece. After all, this axe was forged to shape. So once I filed it to the dimension I wanted, I stopped. If there was a pit, well the pit stayed. I hand polished the body to a high grit then drew it back with a scotch-brite pad. The edge was buffed to a near mirror finish to create a pleasing contrast. The edge is hair shaving shape. I find that using a wooden wedge to spread the haft sideways in the socket and a metal wedge to spread it the opposite direction, creates a wider section at the top of the head that makes it nearly impossible for the axe to come off the haft. On Neckbiter, I inserted a wooden wedge and made an iron wedge similar to the one I documented in Sweden to secure the head on the haft. The haft is 30.5" long. It is made of burnt hickory which has been sanded and polished to a smooth finish. It has been treated with linseed oil to preserve it. It has a subtle octagonal cross-section, and an elegant taper from the bottom to where it enters the socket. Neckbiter is available for purchase: price is $850 which includes US domestic shipping and packaging. If you are interest, send me a PM or email. Finally, if you want to receive email update about future projects, send me a PM or an email to ericmycue374@comcast.net. When I do a haft, I fit it through the bottom of the socket. I know that some makers make a haft that is wider at the top and slip it through the top of the axe head and slide the head up till it wedges at the top of the haft. I'm not saying this is wrong. No one knows for sure how the Viking smiths did it, but there is evidence that the axe was driven onto the haft then wedged at the top. 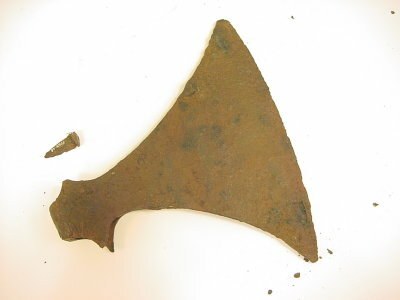 I personally documented multiple axe heads with Peter Johnsson in Sweden that had the iron wedge with the axe head. First off, absolutely awesome axe Eric. I love it. I like that you decided to go with the haft going up through the bottom of the socket. I'm not sure why people assume the hafts were mounted in the "tomahawk" style. If mounted correctly it should be plenty strong. If wood-axes can handle a tree, why couldn't war-axes handle a man or shield? Below I have linked a video that shows some Viking type axes found in Ireland in 2013 with part of the hafts still intact using just a wooden wedge (no iron wedge). 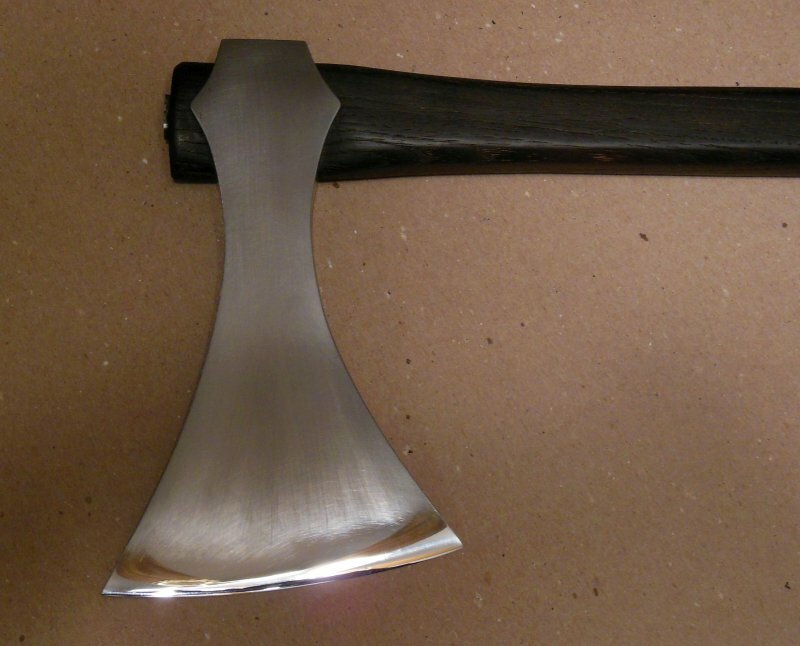 This is the only find of it's kind that I am aware of, but I think it adds further support to the idea that many (if not most) Viking axes were mounted in this fashion. Again, what a great axe! 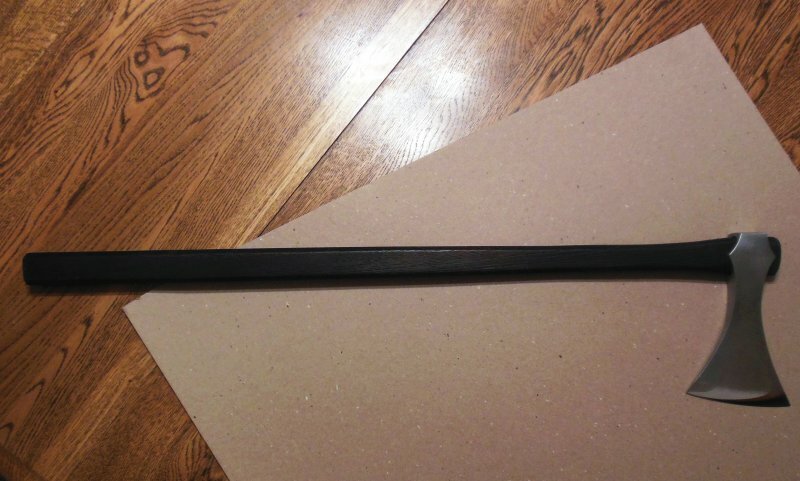 I'm in the process of making a leather axe head sheath that will be included in the price of Neckbiter. such a high contrast between the black and polished edge looks flashy! like all your gonna see coming at you is that bright edge! LOL, I don't usually polish my stuff to a mirror finish, but when I was working on it, the look was interesting compared to the satin body; so I left it. Again, what a great axe!T. Thank you for your email and the very interesting issues you raise. I would think, in general terms, that your theory is most likely correct and I can confirm that there are wedges in the top of the hafts of at least two of the Lough Corrib axeheads. 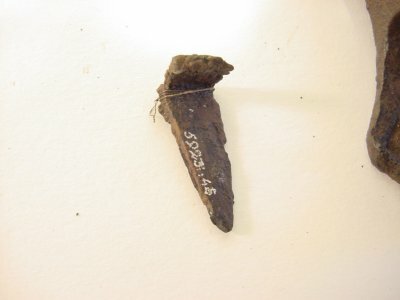 However, they are not iron wedges – they are wooden, as you’ll see in the attached photo. 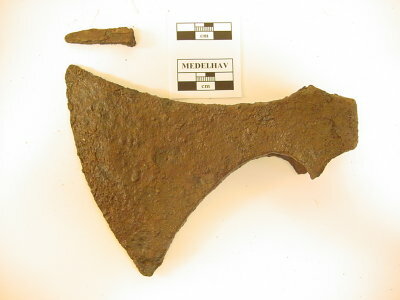 We do have one or two other medieval axes (tools, rather than weapons) with iron wedges. I hope this is helpful to you. 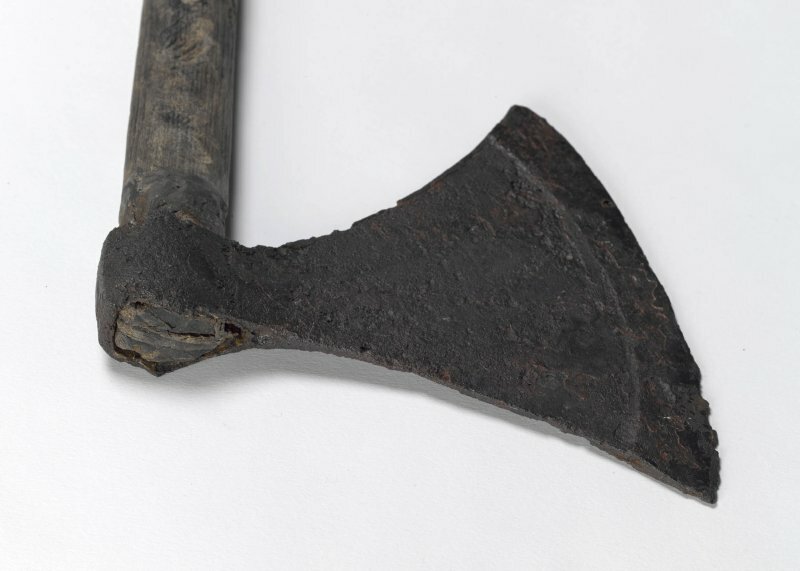 It is my theory that one possible method for axe and haft attachment was to use wooden wedges to spread the top of the haft parallel with the axe head then use a narrow iron wedge to split the wooden wedge and spread it perpendicular to the axe head. This would effectively provide a wider top of the haft that would prevent the head from coming off. In addition, I learned from my carpenter cousin years ago, that the way to put a hammer head on a haft is to allow the weight and inertia of the head to drive itself onto the haft; so, when I put an axe head on a haft, I start the axe head on the very top of the haft, then I pound the bottom of the haft on my anvil. After about 5-6 firm strikes, the head has forced itself down onto the haft. I then use a aluminum dowel and mallet to correct any misalignment. I also try to taper the top of my hafts so that it grows a bit wider where I want the axe head to stop. 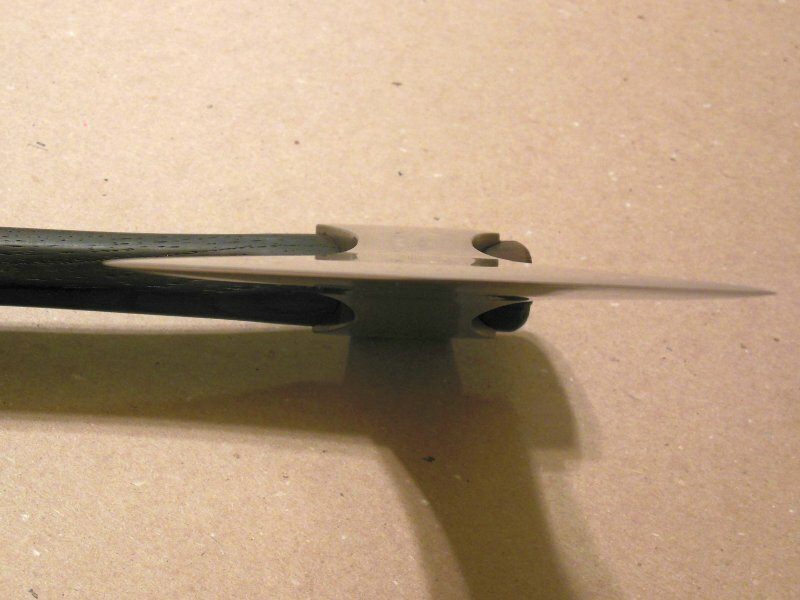 This is the same principle that we use to wedge a pommel onto a tang. The fit is so tight and secure that I have been able to test cut smaller diameter (6-8") logs in half with the axe and not have a wedge at the top. I did this with Patrick Kelly's Type M to test the blade sharpness, blade strength, and the fit of the head on the haft. 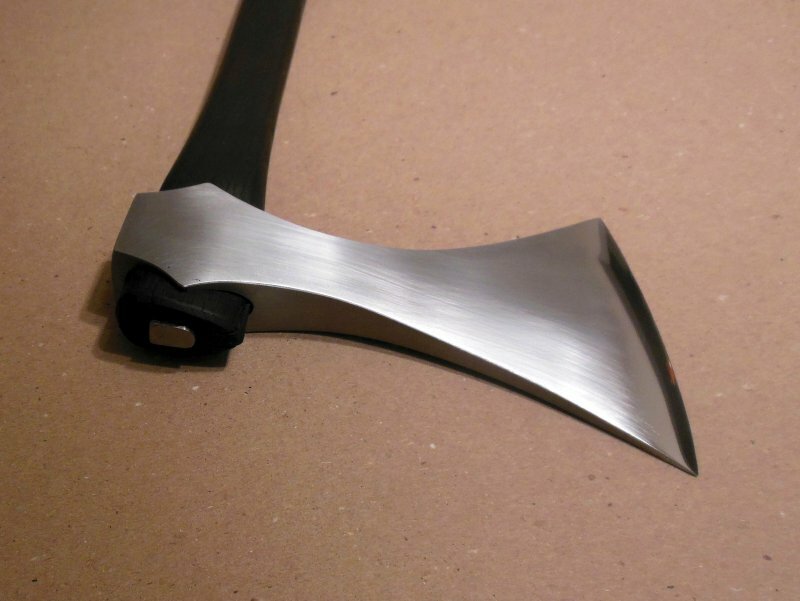 So, you combine a properly tapered haft, a properly seated axe head, and a wedge system at the top of the haft, and I you arrive at what I believe is a historically plausible method for assembling an axe. Of course, please don't read me to say that this is "how they did it." I'm merely putting forward an theory about one possible method. Like I said, food for thought. I welcome other theories as well. I took Neckbiter and another sword to Staples to ship them to their new homes on a Saturday. When I checked the tracking for UPS the next week, all it said was "Ready for Pick-up." I didn't think anything of it because UPS sometimes is slow in updating that stuff, but the first package (the sword) was scheduled to be delivered on Wed. Wed comes and no packages. I contact UPS but they have no record of the package even being in their possession. Thursday I file an investigation. So, now I'm thinking what is the status of Neckbiter. It is suppose to be delivered Friday. I contact UPS and they have no record that it was even picked up. So, now I'm freaking out. I go to Staples cause all kinds of stuff is running through my head: an employee stole them or a customer standing in line heard me talk about them and came in and took them, but I'm thinking how can two large boxes be carried out of Staple without being noticed, but then again, UPS has no record of even picking them up. Nonetheless, I ask the store manager to look at the security tape to see if something strange happened. She was very helpful and understanding. She agreed to review the tape. Conclusion: she saw the UPS man pick up the packages and take them out on his cart. So, now, WTF!!! UPS has no record of them, they were picked up, no one knows where they are...I'm flipping out. Friday comes and Neckbiter is not delivered. So, I'm now depressed. I keep thinking someone stole the packages. I file a claim on Neckbiter and UPS begins to search for the package. Meanwhile, I travel with Peter Johnsson to Kevin Cashen's. The whole time I'm checking for updates: nothing. The whole weekend I am depressed. I get home Monday and I check the status for both packages...nothing...still investigating. So, I email the guys that bought the sword and Neckbiter. I get done sending the messages, and my phone rings, not joking, a minute later. It is Staples. They found the packages. So, I go to Staples, and they tell me that the UPS driver picked up the packages, loaded them in his truck, and drove to the back where he drops off the packages for things that were ordered online. They put these packages in a cage till the customer comes to pick them up. Apparently, he unloaded my packages and put them in the cage. It wasn't until Monday evening that an employee noticed that the two packages fit the description of my missing packages and took them to the manager. CRAZY! What a relief! I asked them to put new labels on them so there is no mix up with the tracking numbers being investigated. So, now the sword and Neckbiter are on their way to their new homes. Anyway, I just wanted to share a crazy shipping story. Damn, Eric, that is crazy. I don't envy you. I have my own UPS horror stories, and one particularly terrible one... but nothing i'm willing to share at this point.